Spend an unforgettable day at Gran Canaria’s Karting track. Gran Canaria is home to Spain’s largest karting track. Gran Karting Club is the biggest Go-carts Track in Spain, and there are Go-carts to adults as well as children. The karts to the children have got speed-reducers so they only can drive 35 – 40 km/h. There is also small motorcycles not more than about 40 cm. above earth level. The 1.281 kilometres long senior circuit is 8 metres wide, excellent for thrilling overtakings. It is a fast circuit, yet technically challenging with speed limit of up to 80kmph. It has seen various top races held here such as the Spanish championship. There is also a children’s track with mini-karts for kids aged 5 years upwards. Have fun!!! The weather conditions all year round make Gran Canaria the perfect destination for those looking for plenty of great fun. Besides traditional kart racing many commercial enterprises offer karts for rent, often called “recreational” or “concession” karts. The tracks can be indoor or outdoor. Karts are rented by sessions (10 to 15 minutes usually), they use sturdy chassis completed with dedicated bodywork providing driver safety. 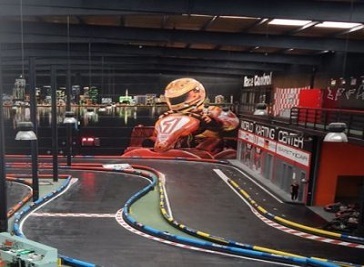 The largest Indoor Karting track in Spain. A track by professionals in the sector and approved by the great “Champion of Spain” Julio Martinez, who has giving us an outstanding note! 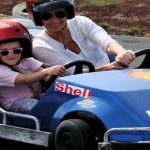 Welcome to Racing Kart Maspalomas, the karting situated in Maspalomas (Gran Canaria) consists of a track where you can have fun with their karts or bring yours to spend a different day.